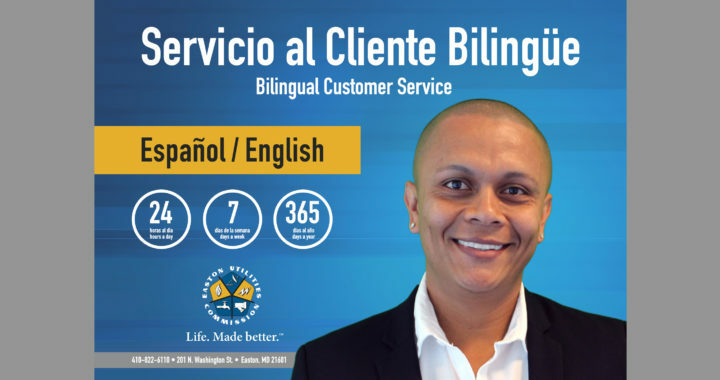 Easton Utilities is committed to providing exceptional service to all customers and is pleased to announce a new option for enhanced bilingual customer service. Easton Utilities is extending their reach to a growing population of customers through several communication methods, including a bilingual customer service representative, a secondary phone interpretation service, and a Spanish translation of our website and other communications material. “We strive to provide the same level of excellent service to every customer and this is just one example of how we can meet the specific needs of some customers,” stated Tracie A. Thomas, Controller and Manager of the Customer Service Department for Easton Utilities. During Easton Utilities’ strategic planning process, employee input reinforced the need for raising awareness of cultural and language differences in the community and implementing better solutions to serve all customers as an essential priority. After performing some initial research and establishing partnerships with several local organizations, an internal committee formed. The committee worked to determine the best path forward to engage and share information with customers who do not speak or read English, primarily focusing on the Spanish-speaking community. An important first step was announcing the role of a key bilingual customer service rep, Anderson Watson. In addition, the committee implemented a phone interpretation service, which can be used by anyone in the organization including lineman, service installers, tech support, and the control room operators. Going forward, the committee continues to translate important communications along with the website and is working to track language preferences for each customer. “We are always seeking additional opportunities to connect with our customers and welcome input,” added Thomas. Remaining true to their mission to enhance the quality of life in our community, Easton Utilities will continue to identify initiatives focused on our increasingly diversified community with regard to superior customer service.